Madagh is a system of paying-it-forward. The word “Madagh” which literally means “sacrifice” is adapted from an Armodox tradition of thanksgiving for a goodness or kindness received. It is an opportunity for the recipient of a blessing in his/her life to acknowledge it by making a donation – monetary, physical work, time, talent – to the organization which in turn uses that donation to assist an individual or community in need. This paying-it-forward means of thanksgiving was prevalent in the early Armenian Church, since Apostolic times, and is refined today to spread faith, hope and love to a broader audience and therefore a greater number of people. In 2015 a tragedy on the LA freeways led to the publication of this LA Times article explaining the concept of “Madagh” to the public. Sako Hakopian, 69, right, and his wife, Ripsik, 65, talk about how they perform “matagh,” or offerings, as part of their faith at the Armenian Church in Glendale on Nov. 4, 2015. Sako and Ripsik Hakopian stood in the pews of their Glendale church and waited for Wednesday night’s Bible study to begin. Ten years ago, they would not have considered themselves avid churchgoers. 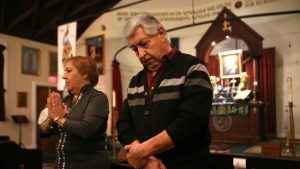 But after their daughter, Yvette, was killed in 2008, Ripsik Hakopian felt an immediate draw to the humble Armenian church across the street from her home. Forty days of mourning passed before Hakopian finally mustered the strength to step inside St. Peter Armenian Church, where her daughter would regularly come to light candles. One year later, the Hakopians made their first “matagh,” or offering, through the church. “I knelt on the altar, and I knew I had to do something,” Hakopian, 65, said as she fought tears. The practice came to the fore earlier this week, following reports that a family had performed a lamb sacrifice days before their 20-year-old son, Richard Pananian, was killed in a traffic accident that sent his body flying onto a freeway sign. In the case of the Hakopians, they paid for food to be donated to people on skid row and helped pass it out to homeless men and women. Matagh is a tradition within the Armenian Church used to show appreciation to God for saving someone from misfortune or granting good health, or for peace for deceased loved ones, according to the church teachings. Pananian’s cousin, Armen Kardashian, said the family are devout Christians and had performed matagh because Pananian had just recovered from a serious health issue. Kardashian wasn’t with his cousin’s family for the matagh and could not confirm that they had sacrificed the lamb themselves. Although the church in Armenia describes matagh as an ancient practice that requires the sacrifice of a male animal with salt to purify the offering, experts say modern interpretations do not call for slaughtering an animal. Instead, they say, the emphasis is on “paying it forward” and giving to those in need. “It’s not necessary to do that, the slaughter, as it says in the Old Testament,” said Mashdots Jobanian, director of Christian Education at the Western Diocese of the Armenian Church. Jobanian described matagh as the purest form of giving thanks. Movsesian said his church practices matagh once a month, and the meat they serve comes from Vons or Costco. Sometimes, he said, the matagh is a vegan meal. Families, such as the Hakopians, pay for meals and go out with other congregants to feed homeless families at a local shelter. “Instead of bringing an animal, we ask the homeless shelter how much it would cost to feed the people,” Movsesian said. For the Hakopians, matagh serves as a means to give back to the community after finding solace within the church, they said. The last time Sako Hakopian saw an actual animal sacrificed as an offering was decades ago when he still lived in Iran. Ripsik said her family never made such an offering. For his part, Movsesian said he hasn’t seen that interpretation of the practice since he was a seminarian in Armenia in the 1970s. But even if there were an animal sacrifice, “the actual practice is not meant as a magical protection service” like some people are interpreting it.